I have not been posting much lately because am helping a friend with some work. Am still waiting for some pictures from King Chef opening ceremony event. So in the meantime, let me post some dish that I cooked recently. This dish is probably one of the most simplest vegetable dish and I could add is one of the more popular Chinese food. 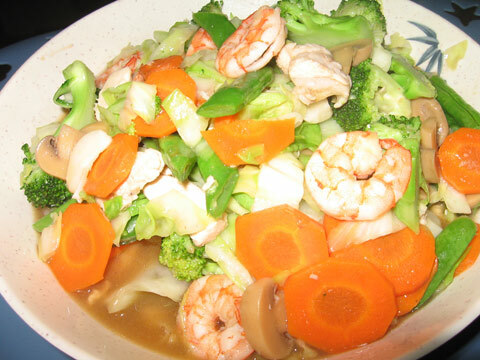 Chop Suey is one of the most ordered Chinese dishes around the world. The taste is kinda foreign friendly and it is easily accepted by the masses. I think the taste really lies on the fresh vegetables with the right cooking technique and not on the ingredient used. Ingredients that is being used are just garlic, sesame oil, oyster sauce and a tiny bit of light soy sauce. So here is version of Chop Suey. Great thing about this mixed vegetables dish is that you can put ADT ( Any Damn Thing ) into it. It can be any kind of vegetables and it still taste good. You can add all sort of mushrooms too. The Filipino version like putting quail eggs into their chop suey which I think is really cool too. How can not one enjoy this high cholesterol food. Tiny and yet super tasty. Like all Chinese style of stir fry vegetables dish, I think most important is the technique of “wokking” with really high heat. This will ensure the vegetables are cook fast and not becoming soft. No matter how many times I cook my Chop Suey, I still can’t emulate the taste of some good Chop Suey dish in my favorite Chinese restaurant in Singapore. I sincerely think is his high heat wok that makes the difference. Even if I am given a high heat wok with big flames, I think I still need to master the “wokking” techniques to make it really taste good. But hey, since this is just home cook meal, I can’t really complain.